Dot-TEL Registration is (Almost) Live! Lot’s of Great Names Still Available. Landrush is officially over and we’re in the final hours of dot-TEL pre-booking (AKA pre-registration) before the new extension “goes live”. Starting tomorrow at 7:00 am PST, you will be able to register .TEL names in real time with participating registrars. When Telnic opens .TEL registration to the public, prices will drop to an average of $20 US from the Landrush price of $375. The day before a TLD opens for General Registration is always a busy time for domain investors and participating registrars – and judging by talk on blogs and Twitter, TEL is no exception. Registrars are reporting thousands of last minute pre-registrations. I was curious to see if there were quality names left, so I did some quick dot-TEL searches on random words and phrases. It appears that tonnes of GREAT names are still available on this last day of Landrush. While this shouldn’t be a big surprise give the price tag for Landrush, it’s exciting because it means those willing to invest in .TEL names at $20 a pop will probably snag some good ones. In other .TEL news, Telnic, the .TEL registry operator recently launched a free, open source iPhone application for .TEL names that has been submitted to the Apple App Store and should be available in the near future. Register .TEL on March 24 with an official .TEL registrar. Five Days to .TEL General Registration. Are your Brands Protected? The premium fees that were applied during the public Landrush registration period to dissuade domain squatters from buying .TEL domains for resale purposes will drop by 90% on Tuesday, March 24, 2009. General Registration will see registration fees fall from nearly $400 USD to approximately $20 USD at many participating registrars. The Sunrise registration period was reserved for Trademark owners and allowed them exclusive rights to protect their trademark names. The first-come, first-served Landrush registration period has been designed to allow anyone to apply early for brand oriented names not protected by a trademark, as well as premium names. With the floodgates opening on .TEL next Tuesday, businesses and organizations might want to act now to ensure they control important .TEL domains related to their initiatives. While all businesses risk losing important variations of their primary domain names by neglecting to register them, it is typically high-traffic, high profile companies or organizations that are targeted. Even if trademark laws are on your side, the Landrush registration fee is probably a bargain when compared to costs of legally wresting your domain back from a cybersquatter. The cheapest and easiest method to protecting your trademarks and variants online is to register your domains before someone else does. Businesses and organizations should also consider registering variations of their trademarks and brands including: common misspellings and/or typos, plurals and singulars. Register .TEL names during Landrush, or Pre-book .TEL names risk free for General Registration with an official .TEL registrar. Continuing to make steady progress towards “Go Live” on March 24th, Telnic has launched their WHOIS service for .TEL domains. See an example of a .TEL WhoIs entry below. By executing this query, in any manner whatsoever, you agree to abide by these terms. Contact information: Disclosure of contact data is restricted because of UK and EU Data Protection legislation. The contact details for this contact ID may be available by looking up a domain object in the WHOIS system. The information can also be obtained through the Telnic Special Access Service. Visit http://www.sas.nic.tel for more details. Visit Telnic’s site for more information about .TEL Privacy and how private data is encrypted and stored inside to NAPTR records of type “x-crypto”. A PDF of Telnic’s WhoIs Policy can be found here. Register/Pre-register .TEL domains risk free for Landrush and General Registration with an official .TEL registrar. Nicholas Aaron Khoo over at CNET Asia pinned down Telnic’s Vice Chairman, Fabien Chalandon, for an interview recently to shed some light on .TEL. Their chat resulted in a summary of interesting facts and footnotes in the .TEL story. Apparently Koon hasn’t been keeping up because there is nothing particularly new or noteworthy in this article, however it does provide a snack size summary of key .TEL info that might be good to send to friends or family who so far “just don’t get it”. The longest startup Guinness Book of Records nine years without revenue! Haha… before you think these guys are crazy, they have US$36 million of funding from serious investors and equally serious technical backup from the likes of Siemens and leading DNS experts. Nine years without revenue is quite a challenge, but also gives them plenty of time to grow this service, I would guess? .TEL can even be used for large and complex corporate directories. .TEL can be used for implementing complex global directories for large or multinational corporations using hierarchical pages and sub pages. For example, I was shown a demo by Fabien on how it can easily replace a directory like our Singapore government directory SGDI in a flash. Now, if only this service was introduced a couple of years back, I bet our Singapore Government would have saved a lot of money setting up and maintaining SGDI. Rick Latona, the self-professed “largest domain broker in the world” and publisher of the “Daily Domains” newsletter, interviewed Telnic’s CEO Khashayar Mahdavi on his blog recently. If, like Latona, you are a domain investor who is “not entirely sure what to think about .TEL names, especially when it concerns the reseller market,” you should read this interview. Latona: How can my audience (professional domainers) profit from .TEL names? Mahdavi: The .TEL adds several monetization opportunities that investors should appreciate which widen the ability for a domain developer to generate revenue in parallel with traditional website-driven monetization strategies. The .TEL spreads the risk of investing over multiple methods of generating revenue, such as PPC and premium rate numbers for voting and betting services. There is also value in owning vanity names, whether business or consumer focused. It’s also possible to run a commercial directory service under a .TEL domain and, of course, it is possible to provide links to revenue generating e-commerce storefronts. Additionally, due to the unique content published in a .TEL domain, pairing it with existing investments in .com and other domain names will lead to better SEO – a key goal in revenue generation. How has your launch gone so far? Have you registered more, less or about what you expected? 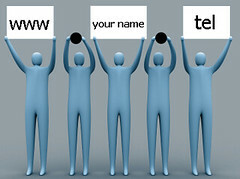 Don’t you think that bloggers and individuals would be more likely to get .TEL names if they were less expensive? The .TEL is now creating new opportunities for the domainer community, as well as a new ecosystem that includes non-traditional players entering the domain name industry, such as social networking sites, directory service providers and Voice over IP companies. Some have already begun the process of becoming an ICANN Accredited registrar as they see the potential of the .TEL as a communications hub for businesses and individuals. We believe that these non-traditional players will be a driving force of growth for .TEL domains and the domain name industry as a whole and lead to a new value being assigned to domain names. Read the interview for yourself and let us know if you think Mahdavi’s answers measure up.